So, what are some of the historic events of 1928? March 21 – Charles Lindbergh is presented the Medal of Honor for his first trans– Atlantic flight. September 11 – Kenmore’s WMAK station starts broadcasting in Buffalo, New York. Were you around in 1928? Probably not. But the antique radio I just acquired was there to hear it all. You can just imagine a family, “watching the radio”, as they listened to the news of Charles Lindbergh, Amelia Earhart, Boulder Dam, and of course Mickey Mouse. 1928 was just a few years after the first radio broadcasts. You an imagine that radio broadcasting was as exciting and full of possibilities as was the beginning of the public Internet in the mid 1990’s. If you own one of these older radio’s you have at least three things. First, you have a piece of history. Second, you have an example of early radio receiver design that is not around any more. And third, you have a usable radio that you can use everyday. 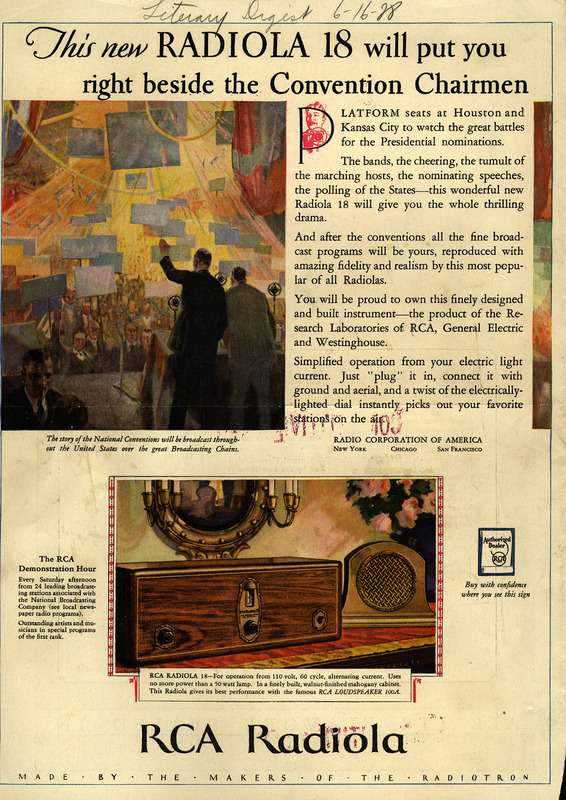 The AM broadcast spectrum has not changed much since 1928 so your vintage radio will still be able to receive the AM broadcast band as it exists today. What people are willing to pay for these radio’s… well… depends on how much you value history. There is a link below of a mint condition RCA Radiola 18 for sale for $450. Lucky for me, I was able to get my fully restored and working RCA Radiola 18 and matching speaker for just $50. Radio is officially dead, especially when wireless internet access comes to your car. When disruptive technologies comes along it sometimes requires us to look more deeply at the traditional concepts we have and the terms (words) that we use to describe these concepts. There are many changes taking place simultaneously having complex interactions that no one can predict in advance. Complicating all this is human reflexivity in response to technology and cultural changes. What’s happening? We are all living in a maelstrom of change. For some, it is the biggest opportunity of their lives. For others, it is nothing but fear, trepidation, and avoidance. Change initiates the great sorting out of people and companies – an act of differentiating individuals and companies, one from another. So what about Radio? What is “radio” anyway? Seth wrote the above in the context of Podcasting back in 2005. There is a segment of the time of day that each of us prefers to listen to media that is limited to an aural presentation. One of these places is your car. When the wireless internet comes to your car will “radio” be dead? When wireless internet comes to your car in a “taken for granted reality” sort of way what will take a hit for sure is your traditional AM/FM radio. What will also take a hit is your local radio stations. Local radio stations along with the traditional delivery mechanism of limited reach (transmitters, antennas, and power) may be in a fight for their life. The FCC granted your local radio station a license to operate at a certain frequency within a certain limited spectrum of available frequencies. They (your local radio station) have a privileged position due to scarcity of available frequency spectrum and the reach of the traditional distribution mechanism. You (the consumer; the listener) don’t have much of a choice when listening to your AM/FM radio in the car. Locality and limited choices may trump content as a preference for your listening. What if the spectrum of available frequencies for AM/FM radio was infinite? And what if no one needed a license from the FCC to broadcast into that radio in your car? What if the reach of your radio was not just the local stations but stations anywhere in the world? What if, as a listener, you had infinite choices? The Pew Internet Project has put together a retrospective of the past 150 years of communications. You can find a link to the full paper (24 pages) at the end of this posting. In addition to the historical facts, this paper includes some interesting predictions made in the historical context in which these communications inventions emerged. …As far as I can judge, I do not look upon any system of wireless telegraphy as a serious competitor with our cables. Some years ago I said the same thing and nothing has since occurred to alter my views. radio distribution of news by central news agencies in the larger cities to thousands of radio stations in all parts of the world” leading to a time when “anyone can simply listen in on their pocket wireless set. I have anticipated radio’s complete disappearance…confident that the unfortunate people, who must now subdue themselves to listening in, will soon find a better pastime for their leisure. to get a common garden-variety of job and stick to it.